The other members of the teams started arriving at the hotel around mid afternoon the following day. 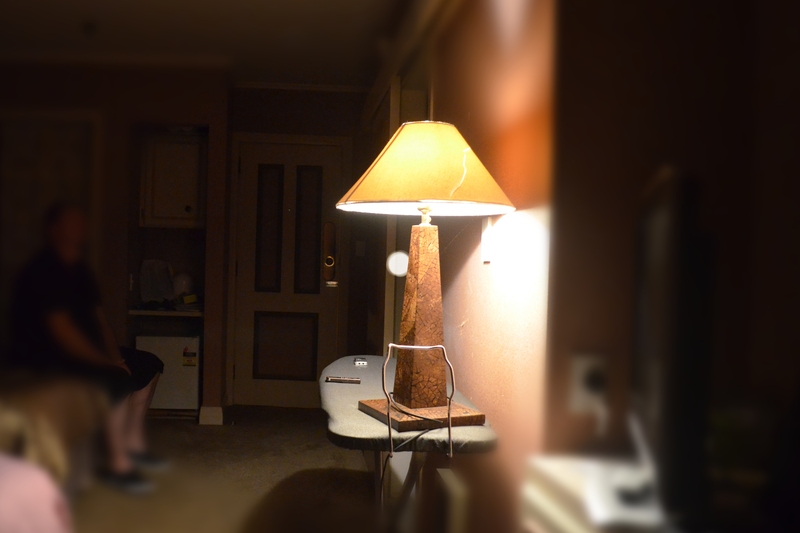 After unpacking and settling in to our rooms we all started a loose exploration of the hotel, to generally get our bearings, get a feel for the place and to sort out the places we would investigate later on that night. “At a spot, in the middle of the room and at the foot of the left most bed, I felt a massive sinking sensation. Like when you go over a bump in the road, and leaves your heart in your mouth. It felt very different in there to other parts of the hotel. This was my first feeling of dread in the place. Until then, we had felt embraced. This felt uncomfortable, more in that room, than the bathroom, and definitely more in that area of the room.” Kris also reported above average EMF fields in this area. A little later in the Room 25 suite, (1st floor, large “suicide” room, 2 smaller rooms adjacent, corridor with arched windows at both ends), James and Mark spent about 30 – 40 minutes doing an EVP session, as the room was going to be occupied later so could not be investigated that night. Whilst doing an EVP session in a storage room in Cat Alley, Barbara and Patrick hear an odd scratching movement which seemed to be in reply to one of their questions. A quick search around and outside the room reveals nothing. Within minutes after, they then capture a what appeared to be a EVP of a man’s voice on their audio recorder. 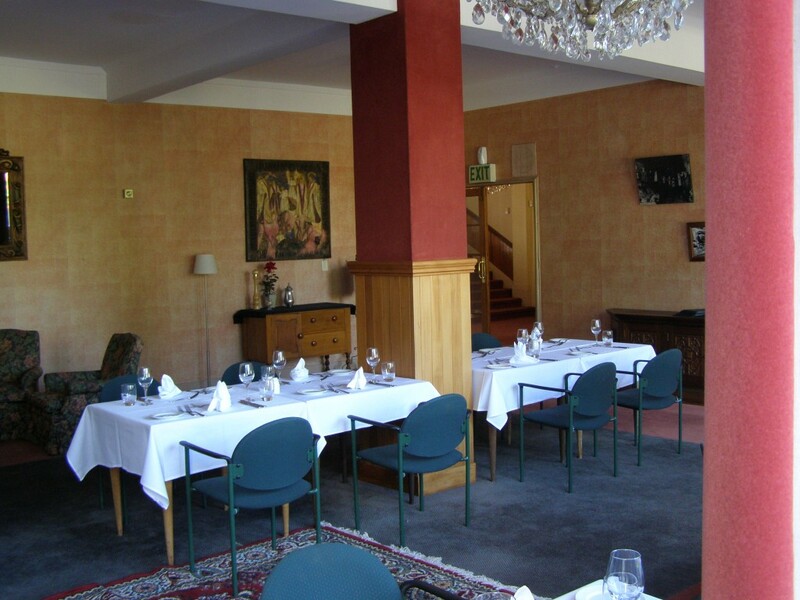 The teams adjourned to a local cafe/bar for dinner at around 6.30pm, returning to the hotel after sunset to begin the night-time investigation. 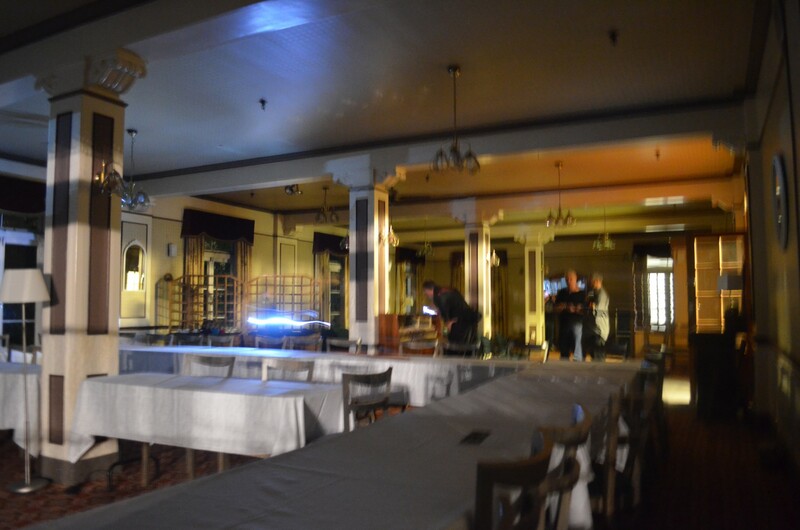 The above photograph was taken by our investigator Kris in the hotel dining room, looking back towards the lobby. 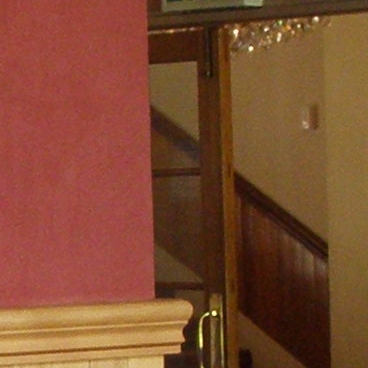 A light anomaly can be seen on main stairway through the glass doors. There was some debate within the team over whether the anomaly is positioned on the stairs themselves, or whether it is simply a reflection in the glass doors. Photographs taken from other angles did not provide any evidence to back up the reflection theory, so we have included this photograph as being unexplained. 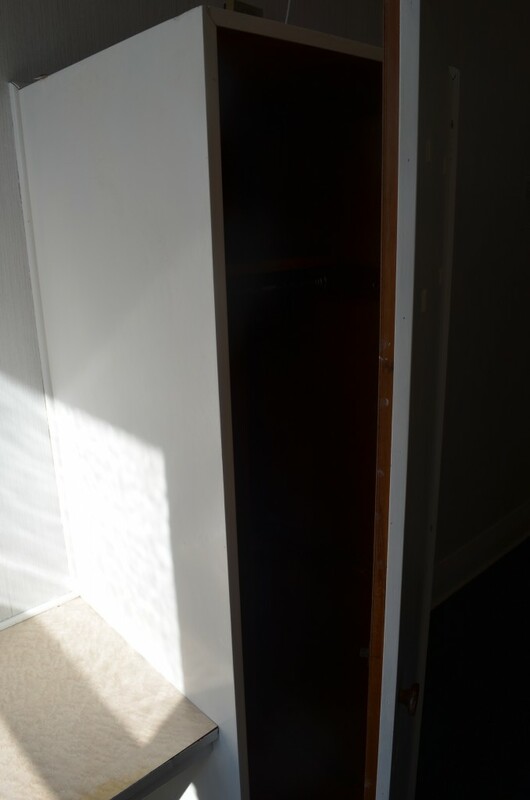 This photograph, taken by our investigator Matthew, shows what appears to be a mist inside a wardrobe in one of the unused rooms in the wing of the hotel undergoing renovations. Some stickers on the walls indicated that this may have previously been a child’s bedroom. Below is a contrast-enhanced copy of the photograph which shows the mist in more detail. A possible alternate explanation for this anomaly is light bleeding on the camera sensor from the over-exposed areas of the image. This photograph shows a cross belonging to our investigator Barbara who stayed in Room 12a. 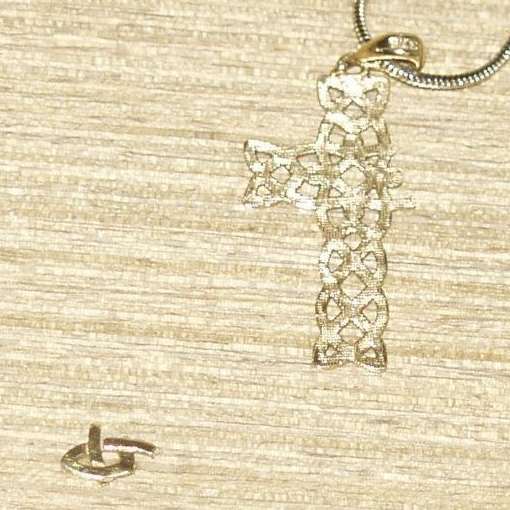 Barbara woke in the morning to discover her necklace had broken and immediately took a photograph of it to document as evidence. 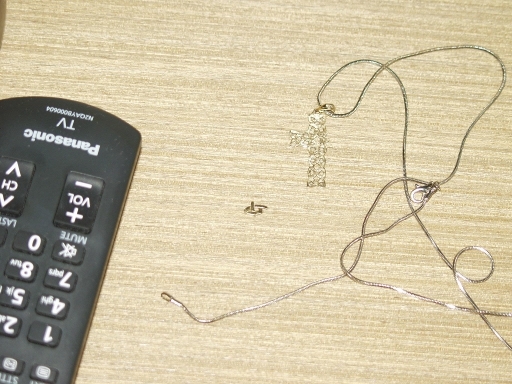 Barbara is certain the necklace was in one piece when she placed it on the table, and that it must have somehow broken overnight. The odd voice in the above recording was captured during an E.V.P. 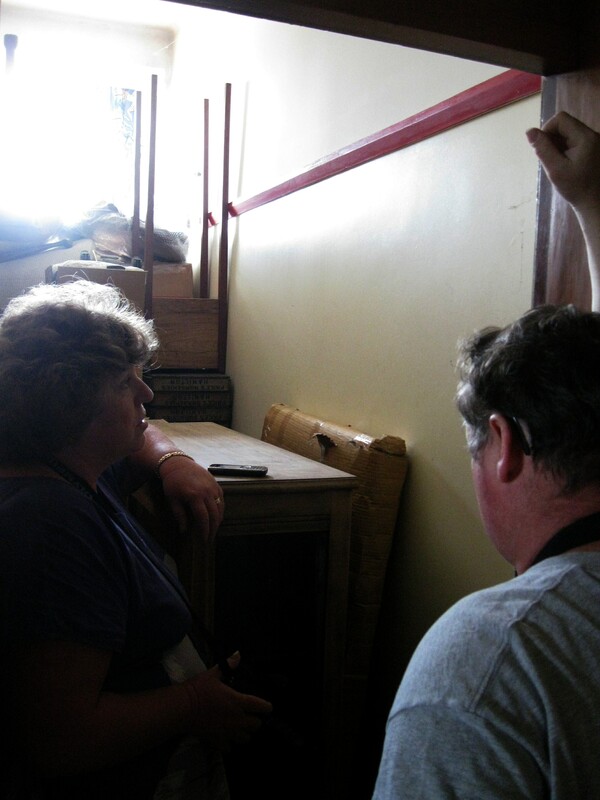 session conducted by Barbara from Haunted Auckland and Patrick from Strange Occurrences in a storage room near Cat Alley. An out-of-place, gruff male voice is heard 2.5 seconds into the recording, as well as several other instances where there appears to be a third person talking over top, or in the background. 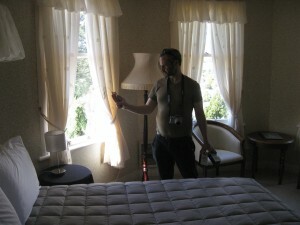 The recorder was stationary for the whole EVP session (shown in the photograph to the left). 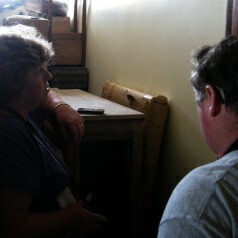 The recording above was made in Room 12 by our investigator Matthew while he was alone in the room. A whispering female voice can be heard at around 15.5 seconds, saying 3 syllables. The team could not reach a clear consensus as to what is being said so we leave it up to the listener to draw their own conclusions. Note: The above image is not photographic evidence of the paranormal. This image is an artistic representation of a light anomaly experienced by our investigator Matthew during an E.V.P. session in Room 1. 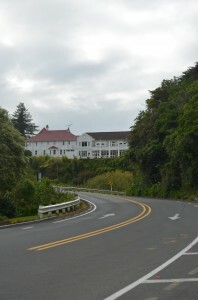 The team had attempted to book Room 1, due to the history of activity associated with the room (one such event is documented in Spooked: Exploring The Paranormal In New Zealand by James Gilberd), however the room was being used as accommodations for the hotel manager. 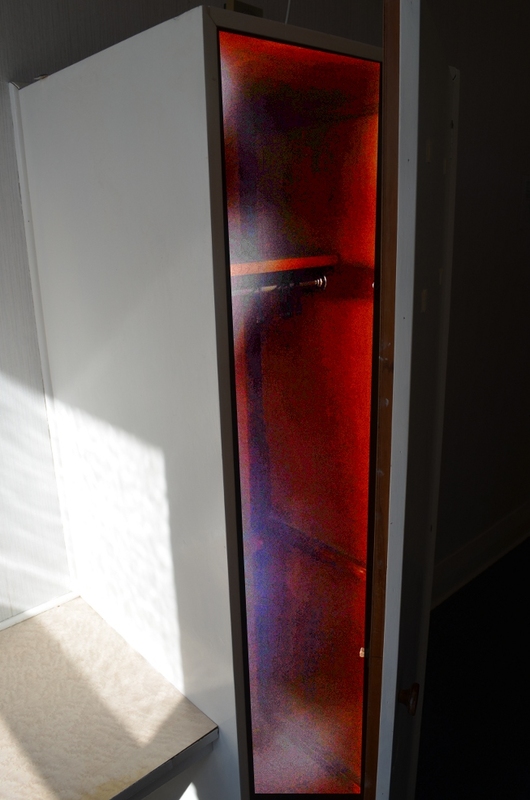 The light anomaly appeared as a circular orb in the doorway to the en-suite bathroom where, at exactly the same moment, another investigator Kris who was sitting in the en-suite experienced an energy passing through this torso via his back. Nothing unusual appeared on our photographs or audio during this time. While alone in the renovation wing, Patrick from Strange Occurrences experienced what he described as a knocking on the window of the 2nd room on the left as you enter the wing. While further investigation showed that the window was loose and could easily be rattled by a breeze, there was no significant breeze that evening, and force of the knocking was rather unsettling to Patrick. After reviewing the two groups’ files of around 2000 photographs, 20 something hours of audio and over 10 hours of static video footage, we were unable to document any conclusive evidence to prove the existence of a ghost, or ghosts present within the walls of the Waitomo Caves Hotel. Both Haunted Auckland and Strange Occurrences team members did notice a few unusual sensations during the physical investigation. However, this does not necessarily mean that the hotel is haunted, as we were unable to capture anything definitive, at this investigation. 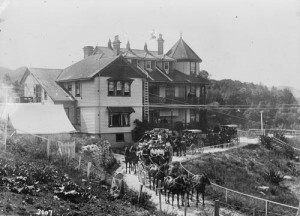 Staff and visitors to this wonderful old hotel have been witness to many incidents and experiences through the years. It is likely at the very least, that the hotel does contain some residual phenomena, considering the amount of visitors staying there and the activities that have taken place within its walls through the decades. The two teams had a great time investigating the hotel and we highly recommend going there to stay if you’re ever passing through. It’s a wonderful piece of history with such mystique and character and an underlying sense of retro style and luxury. The staff was friendly, helpful and very welcoming which made the whole experience extremely pleasant, relaxed and very refreshing. We hope to visit the Waitomo Caves Hotel again soon and would like to extend our thanks, gratitude and best wishes to all there. 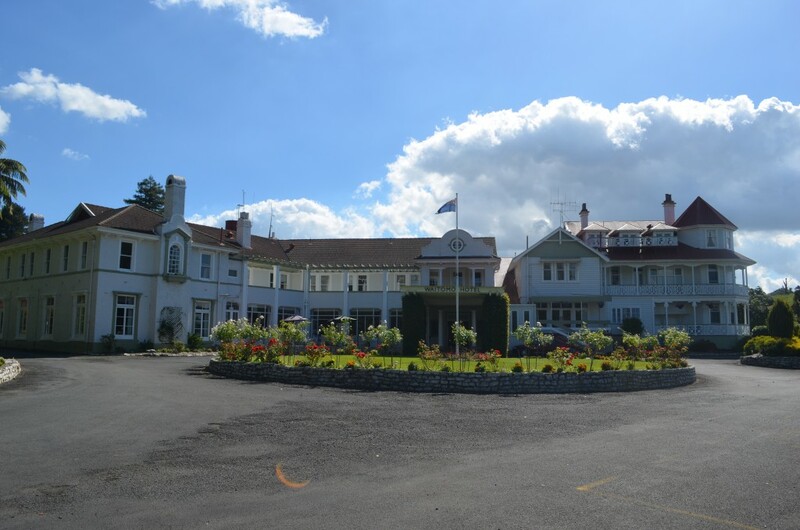 The Waitomo Caves Hotel is, in our opinion, worthy of further investigation. I stayed at the Hotel about 10 years ago with my ex wife to conduct an amateur ghost hunt and we got some pretty cool photos. We were the only guests at the hotel that night so the manager gave us the run of the place! We took very clear photos of a thick white smoke-like substance on the ceiling, orbs and various other weird stuff. Over all, I was pretty impressed by our night there. Hi, I worked at the hotel 27 years ago and we lived in the staff quarters which I believe is now used as backpacker accommodation. Whilst working there some of the staff experience some strange occurrence s in the quarters. I use to hear banging and other strange noises in the room next door yet the room was never occupied. Others felt cold and feelings of something in the room. I found your story to be very interesting as we all thought that there was something there. I loved working there and only felt uncomfortably a few times. We stayed at the hotel last week and knew nothing of the history when we arrived late in the afternoon. We stayed in Room 5 located in the original part of the house. It has main bedroom with a four poster bed and an adjoining bedroom, separated by a short hallway which the bathroom leads off. When I entered the adjoining bedroom which had 2 single beds in it, I immediately felt cold and decidedly uncomfortable but did not disclose this to either my daughter or husband. After getting our bags up stairs and into the rooms my teenage daughter turned to me and said that she could not sleep in that room, that there was something making her feel scared in there. We ended up taking her mattress into our room for the night. My husband is a sceptic, always has been. After leaving the hotel to continue our travels, he told me that he had been woken in the night because the bed was shaking. He said I was sound asleep. He didn’t want to scare me at the time so didn’t tell me until later. He said the funny thing was that in the morning he shook the bed and it squeaked. It hadn’t done this when it was shaking during the night. I also have a photograph of the room with some unexplained effects on the image. I worked as barman/waiter at the Waitomo Caves Hotel in 1981. Ocassionally I would be rostered to work the night shift as Night Porter – basically vacuuming and cleaning the restaurant and cafe, and working as security. In the middle of the night, I was vacuuming in the cafe, next to the double glass doors that led into the hotel reception, when a woman dressed in a full length white dress walked past the glass doors, on the reception side. I immediately turned off the vacuum cleaner and went through the doors into the reception area, to find out what the guest wanted at such a late hour, but noone was there. 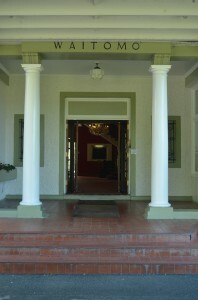 The only exits to the reception area were out the front door onto the arrival portico and driveway, or down a long corridor heading toward the first floor rooms. The doors into the restaurant were locked. There was nobody in the reception area, or in the front entrance or driveway, or walking down the hallway toward the rooms. It literally only took me 5 seconds to stop the vacuum cleaner and walk into reception, which wasn’t enough time for anyone to leave the area. The hotel was a freaky place to be alone at night at the best of times, so the lights were on in both the cafe and the reception area, so it wasn’t like I had just seen my own reflection. It was definitely a woman that walked past the doors in the reception area – nothing strange, suspicious, freaky or scary in that, except for the very late hour. But the fact that there was nobody whatsoever in the receiption area when I opened the doors has always made me believe that on that particular night, I definitely saw one of the ghosts that haunt the hotel. We had our very first stay at Waitomo Caves Hotel last weekend, it was just an overnighter. We had booked a room which was to be in the art deco part of the hotel however we asked if we could possibly change to a room in the older Victorian wing as we thought that it might have more ‘activity’ there. We weren’t disappointed. On two separate occasions, our securely locked door slowly opened by itself. We investigated and came to the conclusion that it couldn’t have been unlocked by staff as we would have heard a key in the lock and the floor creak as someone walked down the short hallway to our room. It had been silent. After the first unexplained opening of our door, I went into the hallway to see if the door could be opened without a key, it could not. On returning to the room, I put the security chain on the door lol. The second time the door opened slowly, it only opened as far as the chain. I didn’t get up from the bed (where I had been sitting using my laptop) but looked up and said ‘hello’. We took a lot of photos while we were there, had a good wander around. Managed to get some pics with unexplained things in them. I even got 3 photos from outside the hotel (in daylight) where ‘faces’ appear to be looking out the turret room window. We checked with staff and that room was locked up and unoccupied during our stay and at the time we took the photos. We had a good time there and hope to go back soon ! Check this link out. I’m pretty sure the Director Gullierom del Toro is talking about this hotel towards the end of the interview. His experience sounds intense! My fiancé and I stayed here 4 years ago and during the early hours of the morning, I was woken up by a lot of noise in the corridor. Footsteps and some banging. It was creepy but I just tried to go back to sleep. I didn’t wanna investigate the noise because I didn’t want to scare myself more. My fiancé didn’t hear anything, but I wouldn’t invent stories. Pretty cool thinking about it now that the hotel is haunted and I’m not the only one who experienced something. I wouldn’t stay there again though.